The inaugural play-off between the two table-toppers saw Frocester post a formidable total of 149 from their 10 overs after winning the toss and batting first. Their total featured some fine hitting from Callum Gegg (30), Louis Gegg (35) and Will Gegg (38*). In reply Kingsholm never quite got going in the face of some fine bowling and finished on 75 from their 10 overs. Chris Whincup proved the pick of the bowlers taking 1-9 from his three overs. The evening was also used a presentation evening for the two leagues, with Martin Berrill, the new sponsor for both competitions, handing out the trophies and MVP (Most Valuable Player) awards for both leagues. Frocester’s Louis Gegg was named MVP for the Stroud League after finishing as top scorer while Quedgeley and Hardwicke’s Jordan Rouse took the Gloucester award with more than 300 runs – including two fifties –six catches and five run outs. 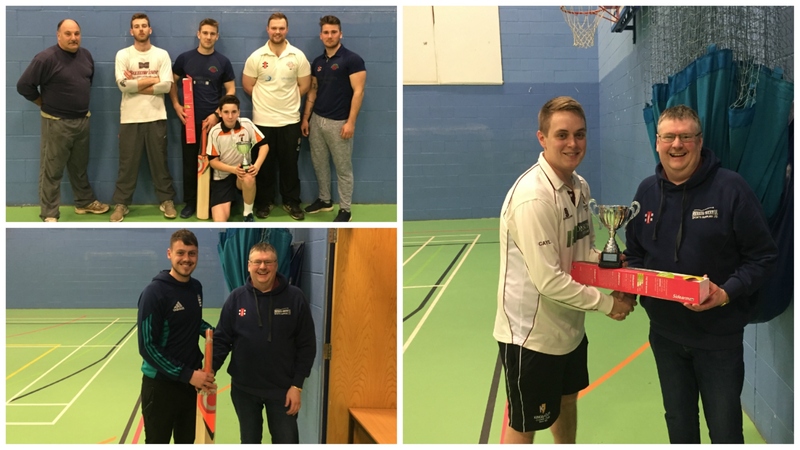 The Martin Berrill Stroud Indoor League grew in size for the 2016/17 season from six to nine clubs with the introduction of two new clubs in Uley CC and Frampton on Severn CC and the return of Frocester CC. The league took on a new format for the season so the nine clubs were split into three groups. In the second half of the season the competition was split into three further groups based on teams’ positions in the first half. The groups threw up a few surprises with both of last year’s finalists – Commoners and Painswick – beaten by newcomers Frampton and Frocester respectively. In the third group Slimbridge ran away with it winning all their matches. In the final group stages Frocester once again proved too strong and ran out deserved winners winning all their matches with Frampton having a strong first season finishing runners-up. Kingsholm CC reached the inter-league final with Frocester after taking advantage of the Gloucester League’s play off system. Having finished fourth in the league table, Kingsholm defeated Corse and Staunton in the first play-off game of the night before going on to defeat Westbury on Severn to reach the final. Up against Quedgeley and Hardwicke in the final, Kingsholm chased down their opponents total of 125 for the loss of just one wicket to claim the title. This year saw and increase in the number of teams entering, and it is hoped that following the success of this year’s competition more clubs will enter more sides into next seasons competition.